Discussion in 'Modding and Hacking - Consoles and Electronics' started by TerdFerguson, Oct 25, 2015. I was looking at the PSX, it looks pretty neat. I was wondering if there is an english bios or if development was ever attemped? How does it work with fmcb? I looked into this myself, and it just looks like loading up the files that the PSX uses to display the XMB text, but with English instead, or something of the like. I haven't looked it up in a few months so don't quote me on that, but I do know you need files on the memory card and the PSX will load those English files and display the XMB in English. As far as other mods like a modchip or a custom BIOS.. There's nothing of the sort for the PSX. Only FMCB mods. It would be a miracle if someone actually worked on something like that for the PSX today. yes it is possible, you simply replace the .xml files on the PSX HDD. You'll need a modded MC running FreeMC boot . copy one folder at a time (overwrite), to play it safe copy individual files at a time. If you need a backup of the original JAP .xml files, I can upload those also (DESR_5500 rip). If for whatever reason you can't use the English files (5000 or what have you)..
MAKE SURE YOU HAVE JAPANESE LANGUAGE PACKS INSTALLED ON YOUR OPERATING SYSTEM! 1. It's rare, given that it failed inside Japan and never saw a release elsewhere. Likewise, spare parts are going to be super rare. 2. The system is at least 10 years old now. 3. Being a Digital Video Recorder (DVR), some people would have been actually using it to record TV programmes. As such, it's possible that its HDD is already nearing the end of its lifespan. Even if this wasn't done, the HDD is NOT switched off as you game. So the HDD's lifespan is always being slowly ebbed away as you game. 4. Without the HDD unit, your PSX unit is as good as dead because the XMB is stored on the HDD. 5. There is no way to use a standard ATA disk with this unit.... yet. 6. Unlike the PS2, it has two lasers. One would be a SONY KHS-400C (PS2 laser) and the other is the main laser that is either a SF-DB11 or KWS-200A. Both types of the main lasers are rare and losing it will mean that the console will not boot even PlayStation 2 games on its own. Unless you use FMCB, but then the XMB (which is a key feature of this console) will have no use. 7. There's no service manual for this console, and it's not as easy as some PS2 models to disassemble. People have destroyed some of these consoles by just ruining the flat cables. If you mod the XMB, you are modding the content of the HDD. If you mess up there (or the HDD fails), you just totaled the console. But if you really, really, really want to mod it, be sure to have made a FMCB card for it (not exchangeable with one for the PS2) and make a backup of your system files. In the case of @LeHaM, his HDD failed right when he was copying files to the HDD. Digmac and LeHaM like this. Also if the xmb is installed on the hdd couldn't something similar be made for the regular ps2? An XMB on ps2 would also be pretty amazing. But there's probably a whole different bios layout that tells the system to boot from certain hdd files? Sorry but the PSX has 64MB RAM (twice as much as a normal PS2) and 8MB IOP RAM (same as the PS2 TOOL) so nope a retail PS2 would not be able to run the XMB as is. I think that it would be more worthwhile to write a clone piece from ground up. 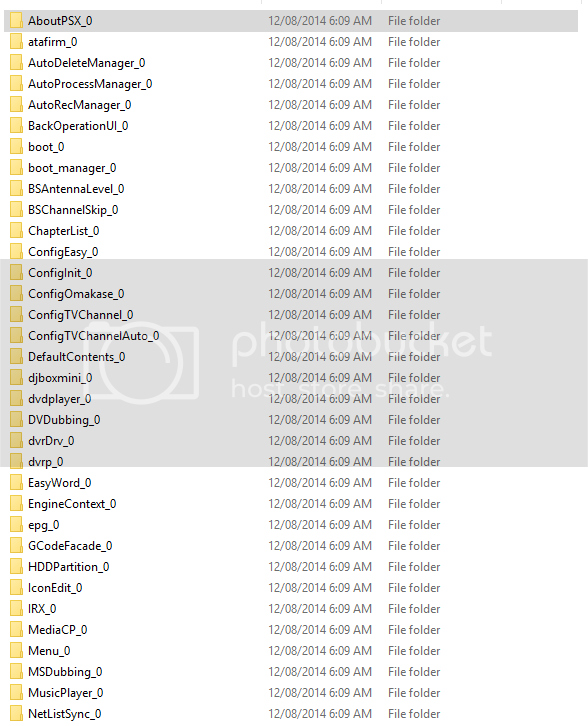 Some of its files are also heavily encrypted, so modding the software isn't possible at the moment. But there's probably a whole different bios layout that tells the system to boot from certain hdd files? They share the same boot specifications, except that it supports booting from flash storage. As with any PlayStation 2 console, the PSX's boot ROM was made to be backward-compatible with the SCPH-10000. Hence it's capable of booting any OSD meant for the retail PlayStation 2 as well, except that you're not allowed to install such a thing to begin with (all HDD Utility discs are blacklisted in the XMB). The XMB, like the OSD program from the PS2, will use its own modules and IOPRP image. It might not be compatible with the retail PS2 because its kernel lacks some functions (i.e. to switch the memory mapping) and its MECHACON lacks certain functions (i.e. Bypass remote control, signal game start, change system from PS2 to rainbow mode).